Dr. Cohn is a board certified orthopaedic surgeon and sports medicine specialist with a clinical focus on arthroscopic treatment of the knee, shoulder, hip, ankle, and elbow. Dr. Cohn also specializes in anterior cruciate ligament reconstruction, complex ligament reconstruction of the knee, hip labral injury, and shoulder replacement surgery. After graduating from Mount Sinai School of Medicine with distinction in research, Dr. Cohn performed his orthopaedic surgery residency at NYU Hospital for Joint Diseases where he was recognized for his leadership and clinical teaching. He completed his sports medicine fellowship training at Massachusetts General Hospital and Harvard Medical School. 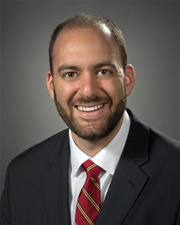 As a fellow in sports medicine and shoulder surgery at Massachusetts General Hospital, Dr. Cohn served as an assistant team physician for the New England Patriots, Boston Red Sox, Boston Bruins, New England Revolution, and numerous colleges and high schools, gaining experience in treating athletes at all levels. Currently, Dr. Cohn is the team orthopaedic surgeon for Hofstra University and several Long Island high schools. He also serves as the director of Northwell Health s Dance Medicine and Performing Arts Program, Young Adult Hip Preservation Program, and as the medical director of the Hofstra University Athletic Training Program. Dr. Cohn's academic titles include Assistant Professor of Orthopaedic Surgery at the Zucker School of Medicine and the Associate Program Director of the Northwell Health Plainview Hospital Orthopaedic Residency Program. Dr. Cohn's research interests include clinical outcomes of sports medicine procedures including arthroscopic surgery and ligament reconstruction. He has published in numerous peer-reviewed orthopaedic journals on topics including shoulder instability, shoulder injuries in throwing athletes, groin injuries, hip arthroscopy, patella (knee cap) dislocation, joint replacement, and sideline management of athletic injuries. Having grown up in Valley Stream, New York, Dr. Cohn is excited to return home to practice at the Northwell Health Orthopaedic Institute and Long Island Jewish Valley Stream. In his free time he enjoys spending time with his family, playing golf and roller hockey, and following both collegiate and professional athletics. "dr Cohen was outstanding. highly recommend"
"Dr Cohn was highly professional and reassuring. I've seen him several times and feel confident that he provides excellent diagnoses and courses of action for addressing my individual needs." "Dr. Cohn is an outstanding physician that I would recommend highly"
"it's always a little stressful going to the doctor especially a first time doctor. Dr. Cohn was just wonderful- great communication skills and compassion!" "I had been there once before and was very happy with the overall professionalism of the office." "Dr. Cohn has been amazing, every time I visit or call he is attentive and answers all of my questions. On the day of the surgery he was early and spoke to me calmed me down and an amazing job." "explains things in simple layman's language"
"extremely professional and addressed all mine as well as my husbands concerns"
"awesome doctor very kind very gentle"
"I went to Dr. Cohn with my dad. My dad had knee replacement with Sr. Cohn, March 2018. I loved Dr. Cohn. He is so knowledgeable and professional and a nice man." "My son and I saw Dr. Cohn. He is the best. He took his time, explained everything, and we were both extremely pleased with the services provided." "Dr. Cohn was clear and succinct. he answered all of my questions and concerns." "Dr. Cohn is an excellent physician! He establishes a comfortable setting and shows concerns for my emotional needs as we discuss my physical issues." "Explained the whole process of surgery." "i have already recommended dr cohn to several people who have used him and in fact had the same experience as me. dr. cohn also has performed hip surgery on my 19 year old daughter with wonderful results." "Well done professionally and highly recommended"
"I have already recommended Dr Cohn to several friends and family." "All very good thank you." "Dr. Cohn seemed to care." "Dr. Cohn is brilliant and the only orthopaedic surgeon I have ever used." "I trust Dr. Cohen completely." "I was impressed and I told him m right there and then. I've been to a lot of doctors and dr Cohn was one of the best visits." "Dr. Cohn was excellent. He took the time to fully explain the details of my MRI." "Dr. Cohn is the best. I would never use anyone else. He did my dad's knee replacement March 19 & was amazing. He amazes me with his knowledge & comforting style." "Everything went very smooth and professional." "Dr. Cohn is absolutely amazing and I am so happy I decided to use his for my ACL surgery." "Dr. Cohn took time and patience to explain my problem and treatment options in clear, easy to understand language, answered my questions and sought my input to formulate ongoing treatment plan. He's become my go-to Doctor for all Orthopedic issues and I've recommended him to several people." "I am extremely satisfied with the care being offered by physician. He presents a calming and caring approach. I am particularly appreciative of his memory of my specific issues and how he addresses these." "Dr. Cohn was clear and precise about my problem." "Felt that the care provider was being rushed because of tight schedule. He was able to answer a few questions but I felt that he needed to move on to the next patient. Still, have confidence in his professional skills and knowledge." "Dr. Cohn was my physician when I had broken my shoulder & now I am taking my mother for her knee problems because I trust his medical care." "I WOULD DEF REFER DR. COHN. I REALLY AM JUST SO PLEASED THAT I AM FINALLY GETTING HELP FOR THIS CONDITION. DR. COHN HAS MADE ME HAPPY AND HOPEFUL ABOUT RETURNING TO MY LIFE." "Dr. Cohn and his staff are the best! Dr. Cohn took his time, explained everything in detail. had great bed side manner, tremendous patience. Made me feel at ease, that I wasn't just a number, didn't rush me, made me feel relaxed, and when I left I felt great as I had asked all the questions I came with, he explained to me everything I needed to know and made me feel important and not just a number." "I would recommend Dr. Cohn to anyone,Iwill be seeing him again for other knee." "very professional and explained everything in detail." "Excellent experience. Doctor explained everything to me in a manner that clicked with me unlike prior Ortho docs." "Dr Cohn explained what he was doing and why better than any physician has ever done before. I was very impressed with Dr Cohn and will definitely recommend him to anyone." "never met a Dr like Dr Cohn. nicest man I ever met. so sorry he cannot operate to fix my problem,"
"Dr. Cohn is a remarkable doctor and I would recommend him to absolutely anyone. I cannot say anything bad about my experience as his patient." "I have already recommended Dr C to several friends..."
"I have recommended Dr. Randy Cohn to someone else. He's thorough an easy to deal with." "Because my injury was common I had no concerns other than confirming if there was a break or not. once I was shown my x-ray and saw no break I had no real concerns and treatment was fairly straightforward." "Dr. Cohn was very professional, knowledgeable and warm. He treated me with respect and as a doctor myself, I appreciated it"
"He really show me that he cares about my health and went step by step on the process on how my hip pain will be solved"
"i've already recommended him to someone"
"Dr. Cohn's professionalism & caring are exceptional. 7. Exceptional. " "Very comfortable aware of health"
"Dr.Randy Kohn is sensational. what a fantastic surgeon." "Dr. Randy Cohen is a thorough professional & gentleman." "Very good at explaining what he was doing." "great! very pleased with Dr. Cohen& his staff." "good experience d i have here"
"excellent experience I am returning for treatment"
"yes ! I truly am very happy to be within this group of Doctors." "Dr. Cohn is very courteous and professional." "My entire visit was a good experience." "He discussed all with me and I was confident in his recommendations"
"It was a very good experience"
"excellent experience with Dr. Cohn." "dr. Cohen is obviously good at what he does and that's all I can ask for." "Excellent! I would highly recommend dr.cohn. He was precise, clear and answered all of my questions"
"Arthroscopic surgery with amazing results"
"Dr. Cohn was very clear and explained everything thoroughly." "Dr. Cohn is what every MD should be like." "I had a very good experience with my doctor he is so caring, and very good to me, and also all the nurses and all the staff & God bless you all." "A good experience. Only attentive care." "Is a good doctor. If I get to I will recommend it." "Dr. Cohen is not very warm but he seems to be an outstanding dr."
"The dr. is an excellent person."